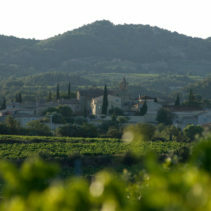 Vacqueyras extends over 1.300 hectares. It has been classified as a ‘cru’ since 1988. The vine varieties are Grenache, Syrah and Mourvedre. There are three types of Vacqueyras wines : red, rose and white. The white wines are 3% if the wine production. We produce three vintages of red wines, one of white and one of rose. The vine varieties are mostly Grenache and Syrah. The name for this vintage came to us naturally over the years of vintages which we tasted. In fact during the ageing in bottles, the mineral taste intensifies. Soil type : Old ‘Mindel’’ Garrigues’ or plains soil, resting on yellow Helvetian sand and sandstone. Pruning : Goblet or Royat cordon pruning with a maximum of 6 spurs and 2 buds. Winemaking : Skin maceration. Direct pressing. Blending of two white wines: Roussane and Bourloulenc. Aging : In dark bottles – 100% oak free. Laying down : Between 4 and 6 years. Winetasting : A lovely freshness and balance in this wine. Hints of white flowers and honey found both on the nose and in the mouth. Finally in the mouth, a saline mineral taste. It is a pressed rose wine. The grapes are chosen from one of our Vacqueyras parcels containing yeasts favorable to making good rose wine. We gave it this name because in the mouth it has the freshness of a dewdrop at the break of day. Vine Varieties : 50% Grenache, 50% Syrah. Soil type : ‘Garrigues’ or plains soil, resting on yellow Helvetian sand and sandstone. Winemaking : Pressed rose wine. Natural indigenous yeasts. Traditional methods. Aging : In bottles – 100% oak free. Laying down : 2 years. Winetasting : Aromas of raspberry. Mouth-watering freshness , fond and vinous. It is a wine and well balanced. We called this wine ‘Garrigues’ because it reveals aromas of the plains or ‘Garrigues’: Thyme, Rosemary, Savoury, Wild lavender. Vine Varieties : 70% Grenache, 30% Syrah. Soil type : ‘Garrigues’ or plains soil and sub soil, on blue marl clay. Winemaking : Traditional, total de-stemming, light crushing, natural indigenous grape yeasts. Aging : In cement vats for 18 months, then in bottles. 100% oak free. Laying down : Between 5 and 8 years. Winetasting : A deep red wine. On the nose an explosion of red fruits. In the mouth, a lovely tannic structure, aromas of the ‘Garrigues’ or plains, and underwood. The name of this vintage comes from the fact that the vines are surrounded on all sides by forest. They are totally enclosed. Soil type : ‘Garrigues’ or plains soil and sub soil, on blue Helvetian marl clay, containing the most complex of clays ‘Montmorillonite’. It is one of the loveliest pieces of land in Vacqueyras. Aging : In cement vats for two winters, then in bottles. 100% oak free. Laying down : 8 to 15 years. Winetasting : A deep red wine, on the nose, with characteristics of the parcel: raspberry, liquorice and vanilla. In the mouth, the tannins are fine, silky and delicate. A lovely after taste. The aromas on the nose are found in the mouth, complimented by elegance, finesse and a lovely freshness. A selection of the youngest of our Vacqueyras parcels. 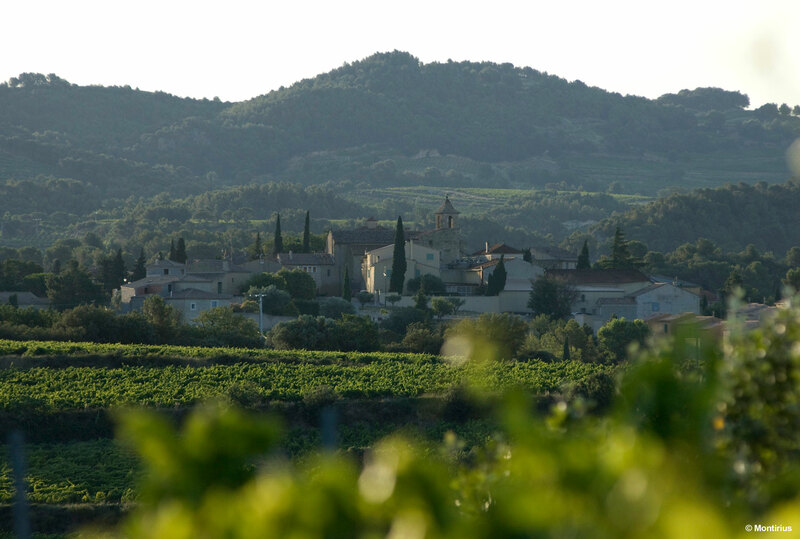 We called this wine ‘Le Village’ as a tribute to the village of Vacqueyras, evocative of this wine classification, and also the name of a much loved village of Provence in the middle of the vines. Vine Varieties : 80% Grenache, 20% Syrah. Aging : In cement vats for one winter, then in bottles. 100% oak free. Winetasting : A lovely easily drinkable wine in its youth, with melted tannins. Aromas of mouth-watering red fruits followed by a lovely tannic structure.